Florida Data Cabling has helped businesses in Hallandale Beach modernize their network cabling and network wiring. If you are looking to update, troubleshoot, repair, or expand your structured cabling, you have come to the right place. We are the premier network wiring professionals in South Florida. We provide a reliable and professional service that you can trust. With years of experience and hundreds of projects under our belt, our technicians understand the complexity and importance of your business having a reliable and secure network service. This is essential for your business to thrive in the competitive market that currently exists in South Florida. We are proud to say that we have successfully helped hundreds of South Florida businesses in places like Fort Lauderdale, Miami, and West Palm Beach to improve the effectiveness of their network cabling. We have worked on large and small projects in Hallandale Beach. We have created a name for ourselves because of our impressive track record and our ability to install structured cabling solutions that are scalable and meet the needs of our South Florida clients. We specialize in Cat3, Cat5e, and Cat6 data cabling. If you need network cabling, phone cabling, phone wiring, or anything else connected to low voltage cabling, we are where you should turn for help. We guarantee our work and guarantee your satisfaction with the services we provide. Our technicians and project managers have worked on projects for large and small offices. We are comfortable working on larger projects that require hundreds, if not thousands, of drops. These include call centers, data centers, centers of education, centers of industry and manufacturing, as well as IT companies. We can supply, install, and terminate all types of structured cabling. If your network system needs troubleshooting or repair, we are your network cabling and network wiring emergency buddy. We understand how complex network cabling systems are, we understand how frustrating network cabling problems can be, and we know how to resolve these problems quickly and efficiently. If you’re having problems with your phone cabling, phone wiring, data wiring, or data cables, contact us. 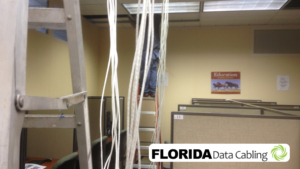 The technicians at Florida Data Cabling will be able to provide you with a solution. We enjoy working with Hallandale Beach businesses in helping them address their network cabling needs. This frees them up to focus on what’s most important to them, running their business. We invite you to see for yourselves why so many South Florida businesses trust us with their data and voice cabling needs. We promise to deliver our services on time. We promise to deliver our services on budget. We strive to carry out our work with zero disruptions to your daily operations. Call us today. Let us provide you with a free on-site estimate.